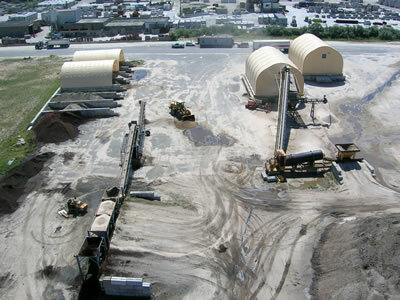 Roanoke Sand and Gravel Corporation is known as a reliable supplier of high quality sand and gravel on Long Island. Their products meet ASTM and AASHTO standard specifications and since 1954, their name has continuously appeared on the approved list of Sources of Fine and Coarse Aggregates for the New York State Department of Transportation. Roanoke aggregates are also approved for use in New York City Department of Environmental Protection projects, as well as New York City D.O.T. projects. In the event that project specifications do not coincide with typical municipal or governmental agency requirements, custom processing is available. Concrete Sand – Meets ASTM C-33 and NYSDOT materials specifications 703-07. Used in Portland cement concrete for road paving, building foundations, bridges, and pre-cast products. Asphalt Sand – Meets NYSDOT material specifications 703-01 and NYSDOT Super Pave mix design criteria. Used in hot mix asphalt for road paving, parking lots, highway reconstruction and maintenance. Masonry Mortar Sand – Meets ASTM C-144 and NYSDOT-7 material specification 703-03. Used in brick and block mortar, patchwork, and finish work on concrete walls. Cushion Sand – Meets NYSDOT materials specifications 703-06. Used for concrete block slope paving, pedestrian brick and block walkways. Screened Gravel – Meets NYSDOT material specifications 703-02. Various sizes are available from ¾” to Pea Gravel. Used as backfill material around septic and leaching systems as well as bedding material for various piping applications. Crushed Gravel – Meets NYSDOT size designation 1A and 2. Used in Portland Cement Concrete and Bituminous Concrete applications. Golf Course Mixes – For use in public and private golf course applications. Race Track Sand – Used by New York Racing Association to rehabilitate Aqueduct and Belmont Race Tracks. Arena Sand – Used in indoor and outdoor riding arenas. Grout Sand – Meets NYSDOT materials specifications 703-04. Used in repair material for marine applications. Used in high strength grout for resetting or repairing bridge bearings and pile caps. Pipe Bedding Sand – Used as bedding material under steel, concrete, and PVC pipe application. Playground Sand – Used in public playgrounds, under pools, and other recreation applications. Tunnel Sand – Approved by the New York City Department of Environmental Protection. Used in various tunnel, viaduct, and large culvert applications. Sub-base Material – For use as foundations for roads, parking lots, and driveways. Winter Abrasives – Sand and salt for use in winter salting and sanding operations. Fill Material – Clean fill for all backfill applications including material for specification backfill applications. Fill Material – Clean fill for all backfill applications.